Quake gets to be quakier than ever in SHIELD’s fifth season finale. There’s been a lot of buzz around Agents of SHIELD’s last few episodes—not just because fans were waiting to hear if the show was going to be picked up for a sixth season, but because the show set itself on a collision course with the earth-shattering climax of Avengers: Infinity War. But SHIELD’s season finale went on a different path. So yes, after a couple of weeks of anticipation, it seemed like a near-inevitably that the season finale would line up, timeline-wise, with the moment in Avengers: Infinity War where Thanos snaps his fingers and evaporates half of all sentient life in the universe. Fans sat down to last Friday’s ominously titled “The End” dreading, running from, and anticipating that a dusty destiny would still arrive for Coulson and presumably half of the crew. JEFF BELL: Part of what happened was, they changed the release date. BELL: And we move at a different schedule than they do and so suddenly everything was a week earlier, and so we had to make some adjustments and that’s how we end up with our story. WHEDON: Right. And the other thing is that there’s certain story points that are so — there would really be no way for us to address it and keep our show intact. Given that there’s another movie coming out, and there’s gonna be constant repercussions of their universe, so what we felt was that the safe play for our story, and for the integrity of our universe, was to operate outside of it. BELL: To acknowledge it was happening, but that we had our own problems and we’re dealing with that. WHEDON: Right, and also the timeline is a little bit fudged in that we assume that the last couple of episodes of our show take place during Infinity War. We’re running in a lot of real-time at the end of the season. So what did we get in the end? Well, we got an episode of Agents of SHIELD, and a damn good one at that. “The End”—which the producers have said was written like it could be the very last episode of the show, full stop—still had the feeling of being an excellent sendoff to team SHIELD. There was a ton of dramatic weight that paid off in this episode, including Coulson and Daisy’s familial relationship, Daisy’s fight with Talbot (and, err, blasting him off into space Team Rocket-style), and in the team wrestling with the dilemma of whether it should save Coulson’s fading life or instead safeguard the entire world from destruction at Tablot’s hands. Even the tragic twist of Fitz dying to save Mack, after he was so certain he was immortal because of some very complicated-to-explain timeline stuff, felt like fitting endpoint for the journey he’s gone on from dweeby lab tech to outright hero over the last five seasons. Tahiti: An actual, magical place. But above all, it was a perfect conclusion for Coulson, who’s practically spent the whole show on borrowed time, thanks to his resurrection through mysterious Kree-enhanced shenanigans or deals with the devil (well, Ghost Rider, but close enough). Seeing him finally get to be with May, finally going to actual Tahiti—if only for days, a week at most—and discovering it to be just as magical as he’d been told it was, was perfect, as was the fact he left behind a team that had learned everything they needed to know from him to carry on SHIELD’s legacy without him. For so long, Coulson has lived to fight another day; getting an actual end is a well-deserved hero’s rest. Some of these moments, which would’ve been left as truly final farewells if SHIELD hadn’t been renewed, will likely be undone. After all, thanks to the timey-wimey events of the first half of this season, there’s still a version of Fitz somewhere out there in stasis that has yet to experience the current events that the team could recover, putting the seemingly endless tragedy-train that is Simmons and Fitz’s relationship back on track, for the umpteenth time. And who knows, whatever happens in Avengers 4 could also bring back a magically-better Coulson after he expires beside May. But for now, “The End” was a fitting finale for Agents of SHIELD’s first five years, laying the groundwork for a newer version of the team to forge the next chapter in SHIELD’s story. Now that he’s the new director, Mack’s got some interesting decisions ahead of him. 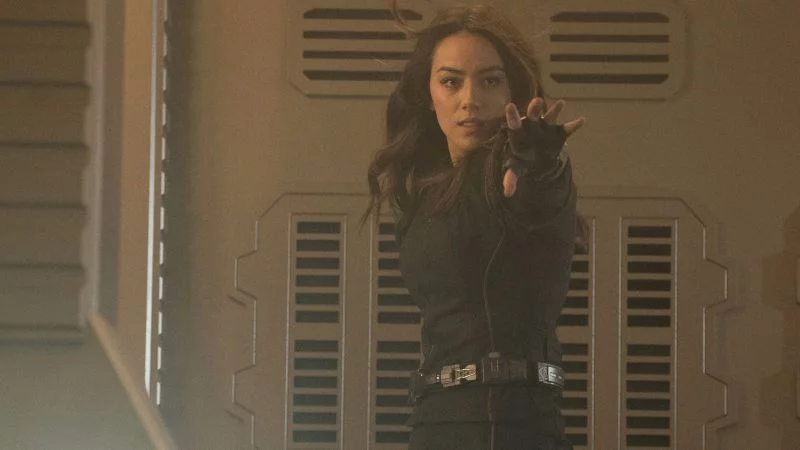 Agents of SHIELD now finds itself in an awkward position into season six—not just with the potential loss of one of its biggest stars, but because the shortened season, set to air in summer of next year, will have to dance around the fascinating world between the events of Infinity War and Avengers 4 instead of being able to fully address it head on. But instead of wondering what might have been, for now at least the show did what it’s done best as it’s grown beyond its roots as an MCU tie-in to an excellent series in its own right: It went its own path, and focused on the journey of the characters we’ve grown to love over these past five seasons. And that’s a better starting point for the show’s future than any momentarily exciting Thanos-induced cast culling could’ve been, really.